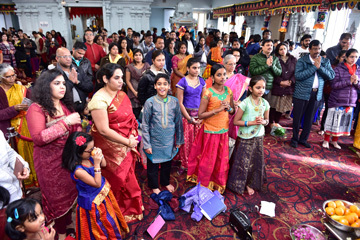 Despite freezing cold weather, more than eight thousand devotees and visitors from all over the Southeast thronged the Hindu Temple of Atlanta (HTA), Riverdale, Georgia, on Monday, January 1, 2018 to celebrate a joyous and spiritually suffused Navodaya (New Year's Day) 2018 festival. The festival took place from 9am to 9pm with children's activities from noon to 3pm, as well as prayers all day ​with shopping and food available. All the deities in the Balaji and Siva Temples wore a dazzling look in their ornate fineries and colorful garlands. Priests cheerfully and reverently performed suprabhatam, Siva abhisekham and Lord Nataraja abhisekham, followed with arudra darshan and then half-hourly archanas throughout the day blessing all the devotees who came to offer their prayers. Both temples echoed with soul-soothing prayers, chantings of shlokas, and devotional songs. Around 11 am Priest Sri Muralikrishna performed a pooja ceremony inside the auditorium, chanting shlokas and conferring his blessings for the New Year to the vendors. Visitors came to pray and to visit the Gift Shop and booths in the auditorium, which were selling Indian apparel, household appliances and gadgets, jewelry, beads, and devotional music CDs and DVDs. 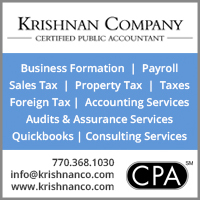 Among the first-time vendors was Banyan Way, a matrimony site that combines traditional and modern matchmaking for Indian-Americans in the USA. Singles, parents, and others are welcome to join Banyan Way to help their friends and family find a relationship. BanyanWay app is expected to be launched in early 2018. Festivals and food go together! The varied menu of South Indian vegetarian splendors like spicy idli sambhar, masala dosas, tamarind or curd rice, upma, boondi ladoos, and snacks were lovingly prepared in the temple’s kitchen by kitchen staff under the supervision of Food Committee Chairperson Padma Koganti. 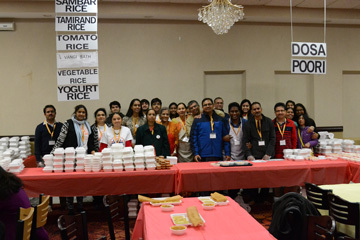 The volunteer team, including Ravi Chander, Ram Maddi, and Vaisheshi Jalajam, helped in arrangement and cheerfully serving the food in the spacious banquet hall. 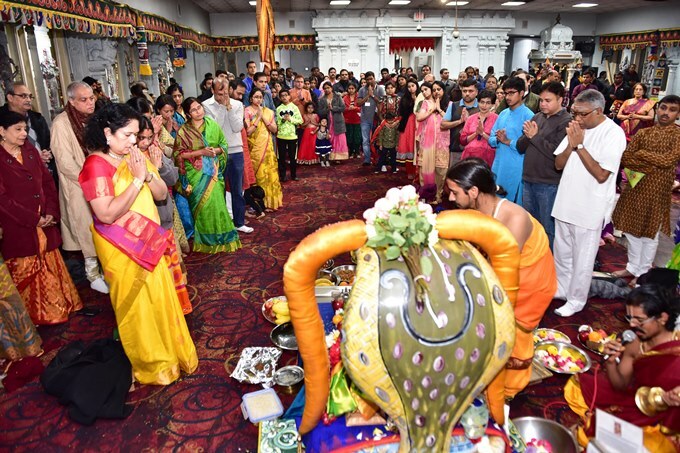 In the evening, devotees filled up the Balaji Temple to participate in Satyanarayana Pooja. The parking lot reached capacity by 11 am, and due to the cold weather, HTA enhanced the visitor’s joyous experience by utilizing five transport shuttles (up from 2 shuttles in previous years). Parking and crowd control volunteers worked tirelessly in the cold. HTA's President Kusuma Kotte, a long-time devotee and official in HTA, reflected on her first year as President and commented on the momentous Rajatotsavam in May 2017 for Balaji and Durga Prathistapana. In August, the elephant Ana added sparkle to the Ganesh Utsav celebrations! There was Maharudra Yagam with Lalitha Sahasra Nama Homam in November, with participation by more than 100 rithviks and 125 devotees respectively. On December 29, Vaikunta Ekadasi was celebrated with devotees there as early as 6 am. A new dress code for HTA visitors stipulates that Indian clothing will be the preferred attire, and clothing such as shorts, athletic gear, torn jeans, and dresses shorter than knee length will not be permitted. HTA’s 2017 Community Support and Outreach included providing shelter to hurricane victims in need, awarding scholarships for students in October, helping build a home for Habitat for Humanity, and assisting people who were in dire need for health and financial aid. Construction of a perimeter wall is planned for early 2018. 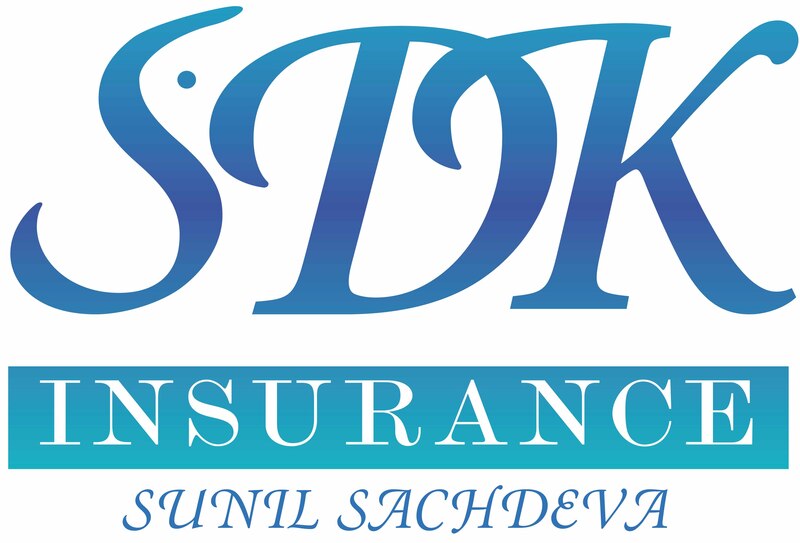 A highly successful Kuchipudi ballet, Sri Pattabhishekam, choreographed by Smt. Sasikala Penumarthi was staged on December 10, to help raise funds for the wall. 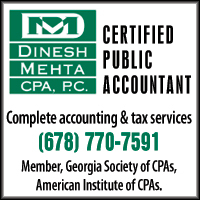 A very special thanks to the parking crew, dedicated priests, temple staff, EC members, Volunteer Committee Chairman Ravi Chander, Food Committee’s Chairperson Padma Koganti, HTA cook Sreenivas Garu, Pooja Committee Chairperson Phani Tummala, our security personnel, and finally, the Clayton county police. Special thanks to the Treasurer Ravi Kari and Joint Treasurer Sairam Surapaneni for working hard on Navodaya day collecting and recording all the donations. The temple continues to offer Bala Vihar, Yoga, dance classes, and language and spiritual education classes.